GEOMAGNETIC STORM: A stream of solar wind hit Earth’s magnetic field on Sept. 11th, sparking one of the strongest geomagnetic storms of the year and auroras in multiple US states. This continues a trend of relatively high geomagnetic activity that began on Sept. 7th. 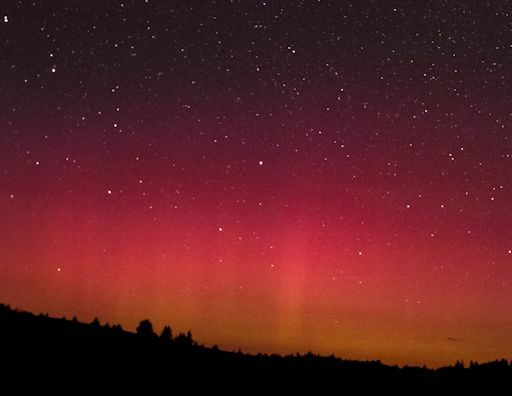 High-latitude sky watchers could see more auroras tonight. This is likely why the 20m band stinks right now. Tonight it might be worth going outside (if you don’t have too much light pollution) to see if there is Aurora Borealis in view. I don’t know about you Southrons, however. This entry was posted in Look! Up in the sky! and tagged aurora borealis. Bookmark the permalink. 15 Responses to Aurora Alert! Cool, Father! Thanks for the heads up! We almost never see them this far south. Hope the storms hold off! May God protect us from all manner of electrical storms. Here on vacation in Vermont (where a stormy cold front is presently slated to move through the area) it is consoling to have the St. Benedict Center nearby in Richmond, N.H., but I’m not sure my traveling luggage contains the makings of a BOB. At least back at home I now have blessed candles, thanks to the Brother Rector of the local Little Oratory of St. Philip Neri who saw fit to distribute some fat candle ends — from, one presumes, such sources as acolytes’ torches and sanctuary lamps — to his L.O. brethren a few weeks ago. Next Candlemas, if I’m around, I pray to have the foresight to add to their number. Mike says: May God protect us from all manner of electrical storms. Especially from massive EMPs caused by CMEs or other means. Brrrrrrr! I have a twinge of anxiety when I hear that Aurora Borealis can be viewed that far south. But we seem to be doing okay … at least right now. Never fails! Some celestial event occurs and it’s cloudy with rain over NJ. It was about 156 years ago this week that the famous Carrington Event occurred — 1859. The earth got hit with a CME of such enormous magnitude that aurora could pretty much be seen world-wide. Gold miners out west saw the overly bright sky in the middle of the night and assumed it was morning and began making breakfast (no Timex watches back then.) Telegraph instruments and pole lines began sparking and working on their own — some operators reported being able to send and receive messages with no batteries connected to power the circuits. I can only imagine what would happen today with such a horrific blast — probably a halt to most if not all RF-based communications and satellites. High voltage power lines acting like antennas would probably start sparking and catching fire, transformers exploding, massive power outages. A good time to dodge the QSB with your CW skills, Father! 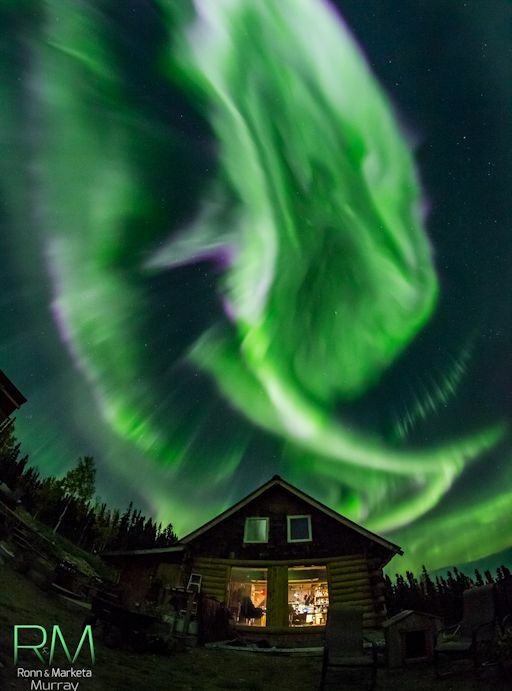 And it was Our Lady of Fatima that warned us that when the Aurora Borealis came, God was going to punish the world. Sure enough it happened and the second World War broke out. People, get you butts to Mass every day and pray the Rosary daily for the destruction of islam and the conversion of these savages to the Holy Catholic Church through the Immaculate Heart of Mary. This may be too technical a question to ask, but does the color of the aurora really change spectral colors as a result of changes in latitude? I would think that the electromagnetic component might because of diffraction, but the charged particle stream increases in transit time with increasing axis angle, but that would seem to put the lower frequency colors, like red, more north than the standard greenish color, not more south, as in this case. Is it just a case of the ionized particles hitting dirty, chemically contaminated air in Virginia? Anyone know? I saw with my own eyes a “blood moon” Saturday before last here in New Mexico. I know anti-Catholics like Hagee are all-over this phenomena, but they are piggybacking off, really, Jewish– and even New Testament–prophecy. I think something unusual is brewing, especially with the stock market gyrating as it has been. But, again, how many Y2K-esque scares will we have that come-and-pass! Nevertheless, a solid rosary, some extra food, a Glock 23, Remington 870, and Rock River Arms AR-15, are always good to have on-hand should the SHTF, which has happened before, and will happen again (some might argue that only the former is necessary, but tell that to the Knights who defended Malta in 1565–they bore sharp blades!). Whether something happens or not, these geomagnetic storms show the power and beauty of God, who is before all things. I posted this link earlier under the “CQ CQ CQ Saturday” post. The link displays images taken of the Aurora Borealis over North America from space on Sept 8 . They are stunning images! I’m sure if you sent them an email or a Tweet they would reply to your query. They’re very friendly. In Marshfield, Wisconsin, at 1 a.m. this morning (Sept 9) there was a white shaft of light across the sky which appeared to originate at the western horizon, a little like the Milky Way, but much more narrow and defined. More like one of those very powerful spotlights. Checked again at 2:30 a.m. and it was gone. Could that be related to the aurora? Wasn’t the Aurora Borealis once considered a harbinger of war? The Aurora Borealis crackled over Fredericksburg Virginia before that fierce Civil War battle was finished. I’ve always wanted to see this phenomena but maybe not under those kind of circumstances! Thanks for lettin’ us know Father. Drove back from Oklahoma late yesterday. We were in the middle-of-nowhere well after sunset. We had a good view of the Milky Way, but no aurora in south central Oklahoma….alas. Looks like all the HF bands are in the dumper, Fr. Z. – VHF, too. The shrouded green figure in the Fairbanks photo looks a little like Our Lady of Fatima.